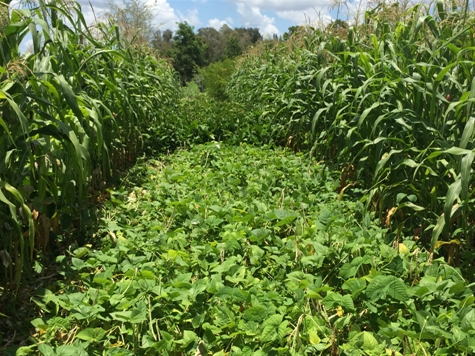 This trial, conducted at the ECHO Global Demonstration Farm in southwest Florida, involves a system developed by the International Institute of Tropical Agriculture (IITA) for intercropping maize with cowpea. 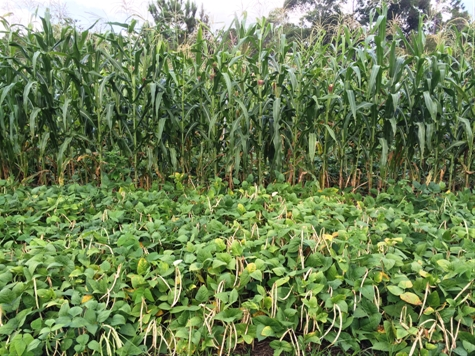 In our trial, we are trying it with two other legumes (jackbean and velvet bean) in addition to cowpea. The land used for this trial had been planted to velvet bean the previous growing season (2014), which resulted in few weeds and an abundance of organic mulch (from the velvet bean vines that died back during the winter dry season). Treatments were simply three legume crops: cowpea, jackbean, and velvet bean. The variety of cowpea used was one in our seed bank called ‘Thai Long’. The velvet bean variety was a long-vined, tropical variety, also from ECHO’s seed bank. Legumes were assigned to individual plots arranged in a randomized complete block design with three replications. After marking the plots, soil fertility amendments were applied just before planting on 7-8 April 2015. Amendments were compost and 8:2:8 (8% nitrogen: 2% phosphorus: 8% potassium) granular fertilizer. Portions of each plot devoted to legumes and maize received the equivalent of 1 metric ton per hectare of compost. The compost for legumes was broadcast-applied, whereas that for maize was banded in a planting furrow. Portions of each plot devoted to maize also received 8:2:8 fertilizer at a rate that supplied a modest 0.9 kilograms of nitrogen per hectare. Once both compost and 8:2:8 fertilizer were applied to the 10-15 cm deep furrows, the furrows were partially covered with soil prior to sowing maize seeds in them. Maize and legume seeds were sown between the 8th and the 10th of April 2015 into rows spaced 70 cm apart. Within each row, legumes and maize were double-seeded with 30 and 20 cm, respectively, between planting holes. Maize was thinned on 30 April to 1 plant per station. 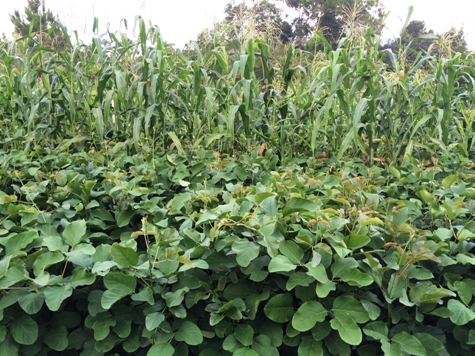 On 14 May 2015, maize was sidedressed with both 8:2:8 (banded along the rows to supply 6.3 kg nitrogen per hectare) and compost (1 metric ton per hectare). A third side-dressing of 8:2:8 was applied on 4 June 2015 (as plants were beginning to tassel), which supplied 14.4 kg nitrogen per hectare. Thus, the maize received a total of 2 metric tons per hectare of manure and 21.6 kg per hectare of nitrogen from 8:2:8 fertilizer. 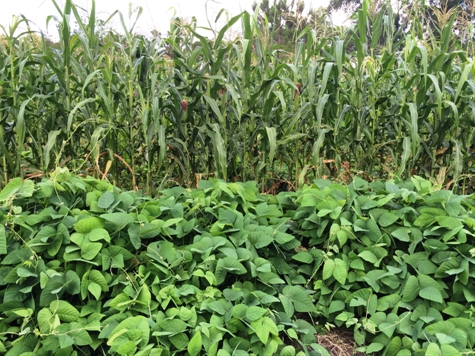 The legumes grew well with the previous season’s velvet bean contribution of organic mulch plus the 1 metric ton per hectare of manure applied in April. As of July, the cowpea harvest is nearly complete. The first photo below is cowpea, followed by jackbean and then velvet bean on the bottom. Notice the abundance of biomass being produced by the jackbean. These pictures were taken on 18 June 2015.